The first of Nintendo’s promised mobile games has materialized, and it’s a doozy. This morning, it announced Pokémon GO, a new Pokémon game for iOS and Android that will use your device’s GPS information to populate the real world with digital critters to capture and nearby players to meet and battle. It’s being developed in collaboration with Niantic Labs, a tech company that was spun off from Google last month. While under Google’s purview, Niantic created Ingress, a successful mobile game that has users visit real-world locations to build up their faction’s resources in the international sci-fi turf war between its millions of players. Unfortunately, the announcement didn’t include any details of how Pokémon GO will actually work. The game’s concept trailer (embedded above) provides a few hypothetical examples buried beneath a glossy mountain of holographic Pokeballs and dramatics. For example, the final scene, where a mob of Pokémaniacs make the very ill-advised decision to run through Times Square while staring at their phones, depicts a collective battle against Mewtwo that’s similar to Ingress’ special live events where many players gather in a single location. The question remains, though, if you’ll be battling and trading with nearby players, how will Pokémon GO jibe with the whole “Hey, let’s not create something that child predators can use to lure kids to their locations” stance that has led Nintendo to create annoyances like its Friend Code system? 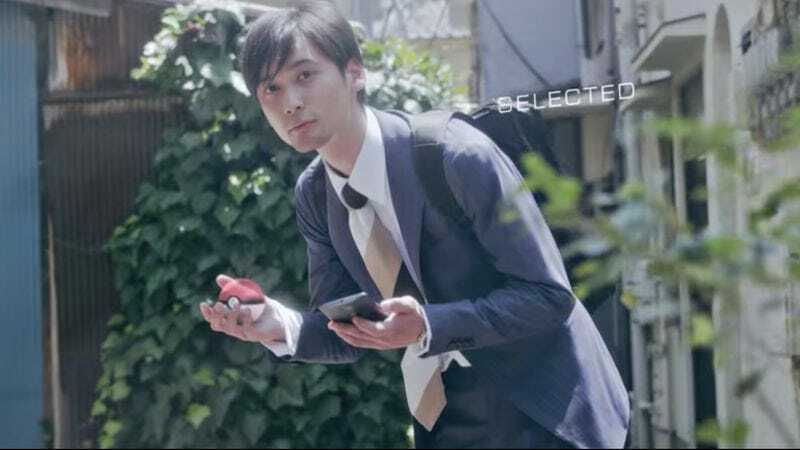 We do know Nintendo plans to launch the game in 2016 and is also developing the Pokémon GO Plus to accompany it, a bracelet that connects to your game and vibrates when Pokémon are nearby so you can press its single, lonely button to catch them without taking out your phone. Pokémon GO will be free to download but includes in-app purchases. At least this early announcement will give everyone plenty of time to start saving for that absurdly priced 100-pack of Great Balls.